They stand out for their great luminosity and for generating a sense of spaciousness, which is why they are essential in small spaces. Another quality to highlight in the white kitchens is that they facilitate continuity with other environments, especially if they are kitchens open to other rooms such as the living room or dining room. Practically with any design and distribution, white kitchens are a success and offer us great possibilities. White is ideal for creating bright environments and with greater visual amplitude, so it is perfect for small spaces. It also offers a feeling of cleanliness and easy maintenance. To renew a kitchen white kitchen you can always use textiles, accessories, accessories and, of course, lighting. As for the decoration of white kitchens, we find several decorative styles with which they are very compatible. The Nordic style highlighted by the c combination of functionality and aesthetics. They are simple and practical rooms, as well as cozy and warm. In the Scandinavian countries, the lack of natural light means that they opt for the white color to provide luminosity to the interior spaces. The wood is another protagonist in the elements Scandinavian decor. Another of the decorative styles that suits the white kitchens is the Industrial. This has its origin in the adaptation of factories to habitable houses, reason why it has very special and marked characteristics. In industrial kitchens we find materials such as steel, aluminum, cement, exposed brick, iron, wood, wrought iron furniture, etc … The white kitchens of this industrial style are always a trend. The white kitchens of minimalist style stand out for the simplicity, for being functional, and not saturating the space with unnecessary pieces. They stand out for the use of materials such as steel, glass, aluminum, etc … The order and cleanliness is priorities to create a balanced environment that imposes an aesthetic seriousness. The white rustic kitchens are also timeless. They are characterized by the use of natural materials such as wood. The kitchen furniture stands out for having rounded finishes and with reliefs. Marble counter tops and other natural stones predominate, always in light colors. They are inspired by the English countryside, which highlights the predominance of white combined with mint green . The color white and wood are an ideal combination in the kitchen, as they complement and add up. They have many possibilities. The key is to opt for white furniture and allocate the wood to certain details. The details make the difference. In this kitchen, for example, wood has been used for certain details such as shelves, stools, window frames, among others. This has created a warm and comfortable atmosphere. We love white kitchens with wooden islands. In this project the counter top of the island stands out for its thickness, providing beauty and robustness to it. We also find an original detail, the wooden boxes that have been used as open shelves. Another solution is to combine the wood cabinets in the work area in natural color, with the kitchen furniture in the background in white. The oven is integrated in these paneled cabinets. Highlights the beautiful island to match, with fantastic metal stools in white. To give greater warmth to the environment has opted for a floor of hydraulic tiles. The countertops give a lot of play in this important stay of the house. They are a good solution to achieve the desired contrast. Those made of quartz or marble are perfect. The floor or kitchen floor is another element with which you can a beautiful contrast. The wood or imitation floors always provide warmth. Place in the front of the kitchen tile mosaic hydraulic, is a good way to create a beautiful contrast with the white kitchen. The handles are important to give a different and special touch. In this case it has opted for the golden color to give an elegant and distinguished air to the kitchen. 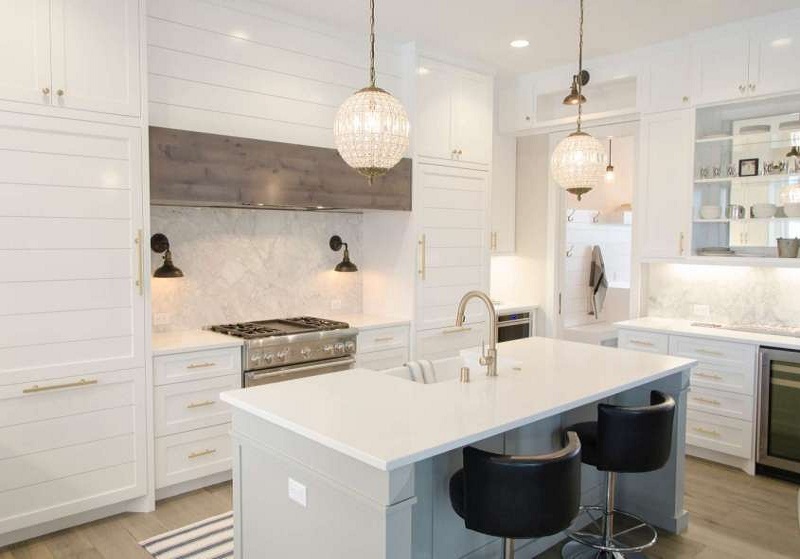 If you opt for a white kitchen with wooden accessories, it is best to opt for clear tones such as oak, maple and beech, with which a more harmonious and uniform environment is achieved. What do you think of these ideas for the decoration of white kitchens? Remember, they are always trend and with some small changes you can easily renew them every so often. However we would love to read your comments and know what you think.